Once you've caught an appropriate pet and sold it to your customer, you might think that it will be the last you see of them. However, the inhabitants of Green Town are completely clueless as to how to care for animals. When we say clueless, we mean it. Expect them to come back and ask you to wash, brush and feed their animals (because they have no idea what 'it' eats). In fact, the entire town seems incapable of caring for any animals at all, making you wonder if you should even be selling them to the hapless citizens. Of course, the games slightly surreal elements won't matter one iota to the intended audience of imaginative little girls. The towns odd inability to provide even the most basic care for their pets does gives the player plenty of chance to interact with lots of different animals each time they play. There's over 40 different cuddly critters to catch and tame, including penguins! Yes, for the first time, you can have a pet penguin. You're also free to dress and accessorise the animals you find and there are a wide variety of items to dress them up in. The only way to play with your animals is by playing jump rope. It's a shame there aren't more games. Play for long enough and contests will unlock in the park at the centre of town. If you've cared for your animals correctly, they'll be able to enter the contests and win new accessories. There are several different types of competition to enter and several grades to win. Your pets will improve their results by repeating the appropriate care exercise (e.g lots of walks and jump-rope for the speed competition). So, is My Pet Shop the game animal crackers kids have been waiting for? Well, not really. For starters, considering how great Cooking Mama was, its surprising to find the interface for My Pet Shop to be somewhat unresponsive. Frequently and frustratingly, icons need several taps with the stylus before they register as being pressed. We also found brushing our pets to be very irritating. In spite of following the on screen directions correctly, the animal would sometimes act distressed, even though we'd only just applied our stylus to the screen. Although the game contains a lot of different animals, they all behave the same. Cats will go for walks just like dogs, for example. While the mini-games have been kept deliberately easy, they show a lack of imagination. Teaching tricks is particularly disappointing. Anyone who has played the excellent Nintendogs is going to be disappointed that the DS's microphone isn't used at all during training. 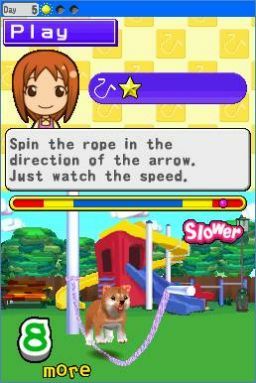 Instead, you simply play a short rhythm game, then the animal somehow translates this into learning a trick. Most damningly of all, although you can play jump rope with your pets (yes, even cats and penguins) you cannot actually "pet" your animals at all! Forget stroking and tickling your dog as you coo into your DS affectionately, because you simply can't, not outside of washing and brushing anyway. My Pet Shop DS is disappointing on so many levels. Graphics and presentation are of a high standard, but are let down by the unresponsive interface. The animals you catch look cute, but they all behave the same. Just like books and films, the very best children's games are loved by adults too. There's very little here for anyone past the age of 12 and while most younger girls will be more forgiving of the games shortcomings, unfortunately we cannot be. A little more time in development and a little more imagination and this game could have been a thoroughbred. As it stands, it's a worthwhile bargain-bin purchase for younger girls who love animals, for anyone else it's as lively as a dead parrot, and just about as entertaining.